Redlining, a process by which banks and other institutions refuse to offer mortgages or offer worse rates to customers in certain neighborhoods based on their racial and ethnic composition, is one of the clearest examples of institutionalized racism in the history of the United States. Although the practice was formally outlawed in 1968 with the passage of the Fair Housing Act, it continues in various forms to this day. Fifty years after the abolition of slavery, local governments continued to legally enforce housing segregation through exclusionary zoning laws, city ordinances which prohibited the sale of property to Black people. In 1917, when the Supreme Court ruled these zoning laws unconstitutional, homeowners swiftly replaced them with racially restrictive covenants, agreements between property owners which banned the sale of homes in a neighborhood to certain racial groups. By the time the Supreme Court found racially restrictive covenants themselves unconstitutional in 1947, the practice was so widespread that these agreements were difficult to invalidate, and almost impossible to reverse. According to a magazine article, 80 percent of neighborhoods in Chicago and Los Angeles carried racially restrictive covenants by 1940. The federal government was not involved in housing until 1934, when the Federal Housing Administration (FHA) was created as part of the New Deal. The FHA sought to restore the housing market after the Great Depression by incentivizing home ownership and introducing the mortgage lending system we still use today. But instead of creating policies to make housing more equitable, the FHA did the opposite. It took advantage of racially restrictive covenants and insisted that the properties they insured use them. Along with the Home Owner’s Loan Coalition (HOLC), a federally-funded program created to help homeowners refinance their mortgages, the FHA introduced redlining policies in over 200 American cities. Blue (“Still Desirable”): These neighborhoods had “reached their peak” but were thought to be stable due to their low risk of “infiltration” by non-white groups. Red (“Hazardous”): Red areas were neighborhoods where “infiltration” had already occured. These neighborhoods, almost all of them populated by Black residents, were described by the HOLC as having an “undesirable population” and were ineligible for FHA backing. These maps would help the government decide which properties were eligible for FHA backing. Green and blue neighborhoods, which usually had majority-white populations, were considered good investments. It was easy to get a loan in these areas. Yellow neighborhoods were considered “risky” and red areas—those with the highest percentage of Black residents—were ineligible for FHA backing. 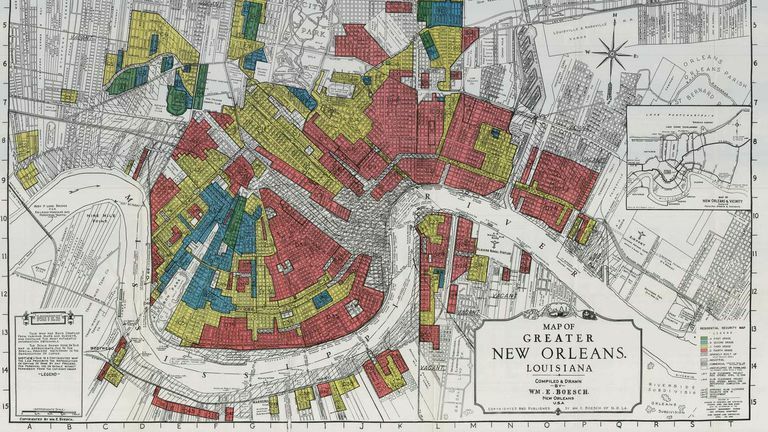 Many of these redlining maps are still available online today. Search for your city on this map from the University of Richmond, for example, to see how your neighborhood and surrounding areas were classified. Redlining policies are not limited to mortgage lending, however. Other industries also use race as a factor in their decision-making policies, usually in ways that ultimately hurt minorities. Some grocery stores, for example, have been shown to raise prices of certain products in stores located in primarily Black and Latino neighborhoods. The impact of redlining goes beyond the individual families who were denied loans based on the racial composition of their neighborhoods. Many neighborhoods that were labeled “Yellow” or “Red” by the HOLC back in the 1930s are still underdeveloped and underserved compared to nearby “Green” and “Blue” neighborhoods with largely white populations. Blocks in these neighborhoods tend to be empty or lined with vacant buildings. They often lack basic services, like banking or healthcare, and have fewer job opportunities and transportation options. The government may have put an end to the redlining policies that it created in the 1930s, but as of 2018, it has yet to offer adequate resources to help neighborhoods recover from the damage that these policies inflicted. Coates, Ta-Nehisi. “The Case for Reparations.” The Atlantic, Atlantic Media Company, 17 Aug. 2017, www.theatlantic.com/magazine/archive/2014/06/the-case-for-reparations/361631/. “The Legacy of Redlining in Rust Belt Cities.” Belt Magazine, beltmag.com/the-legacy-of-redlining-in-rust-belt-cities/. Redlining (1937- ) | The Black Past: Remembered and Reclaimed, www.blackpast.org/aah/redlining-1937. Lab, Digital Scholarship. “Mapping Inequality.” Digital Scholarship Lab, dsl.richmond.edu/panorama/redlining/.